Originally created for military and intelligence purposes, flying drones are becoming an everyday reality thanks to recent commercial success. For roughly €300, customers can purchase the AR Drone 2.0, a quadricopter capable of shooting high quality video from great heights in the sky. Cameramen and robotics geeks can now buy a user-friendly drone for shooting video or images, making it easy to see the many ways in which flying drones could be used to serve journalistic purposes. Pilots and newsmen can forget having to risk life and limb with helicopter flights, in the future the sky may be full of drone journalists. The potential of flying drones for journalism has grown from humble beginnings last winter. The movement began when spectacular video surfaced of a Warsaw riot shot by a semi-pro cameraman using a RoboKopter drone. The video went viral on YouTube and showed the event from a unique perspective no other reporter could have captured without the technology. The first examples of drone usage in journalism began to surface last December when stunning images were captured of demonstrations in Moscow; the BBC was among several news outlets worldwide to use the images in reporting about the event. In another more recent example from January 2012, an amateur photographer stumbled upon a possible illegal dumping site while shooting images outside of a Dallas slaughterhouse. After noticing extreme discolorations in a river running adjacent to the slaughterhouse, the cameraman contacted authorities and an investigation ensued, with images from the photographer used in local reports. While this story fits into the citizen journalism category used by mainstream media outlets, it is an indication of the technology’s versatility. The Australian news outlet Channel Nine was among the first news channels to utilize drone technology in reports. The Australian news team recently used drone technology to conduct an investigative piece on an immigrant detention center located on Christmas Island. 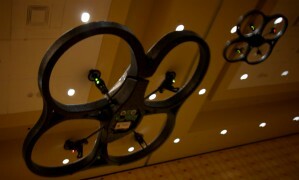 The group gained access to the building by using a drone to fly over the structure, enabling the team to capture footage despite being refused entrance to the compound. Justin Gong, a 24-year old Australian businessman, sees the potential of drone journalism and founded Xaircraft, a company specialized in manufacturing drones. Gong, whose father is a retired Chinese Air Force fighter pilot, has worked as a news cameraman and filmmaker and understands the potential of the technology. “I think this stuff is definitely going to change how we do video and photography,” says Gong. Channel Nine, along with many other companies in Australia and China, currently use Gong’s drones for journalistic purposes. The biggest incentive for drone usage in journalism arrives from the academic world, namely the University of Nebraska’s Drone Journalism Lab. The lab is led by Matt Waite, a journalism professor and designer of PolitiFact, an online fact-checking platform awarded the Pulitzer Prize in 2009. The research lab is tasked with combining literature studies and hands-on experimentation using the Parrot Air Drone to uncover practical uses for drones in journalism. The lab ultimately hopes to build their own drones, designed to incorporate the functionality needed to make the technology more newsroom friendly. Waite is convinced that technology gaps in the field will soon be filled and drones will become a permanent fixture in many newsrooms. Still, some legal and ethical issues have emerged regarding the use of flying drones – with privacy being the most frequently discussed. The possibility of citizens appearing in video shot by drones without their authorization could compromise personal privacy or be seen as surveillance. This aspect of the technology could slow its implementation. On the bright side, a new law recently passed in the United States has “opened” the sky to privately owned and commercial drones. The law, which sets standards on size and technical limitations, stipulates that flying robots must not weigh more than 2 kg and must not fly higher than 120m. Surely, this law should help drones improve their journalistic careers, however many observers still point out the possible dark sides of these new rules – chief among them are fears that drones could become a new tool for Big Brother or to transport weapons designed to harm people.